This guide presents a reference architecture for Pivotal Cloud Foundry (PCF) on Azure. Azure does not provide resources in a way that translates directly to PCF availability zones. Instead, Azure provides high availability through fault domains and availability sets. All reference architectures described in this topic are validated for production-grade PCF deployments using fault domains and availability sets that include multiple job instances. See Azure on PCF Requirements for general requirements for running PCF and specific requirements for running PCF on Azure. 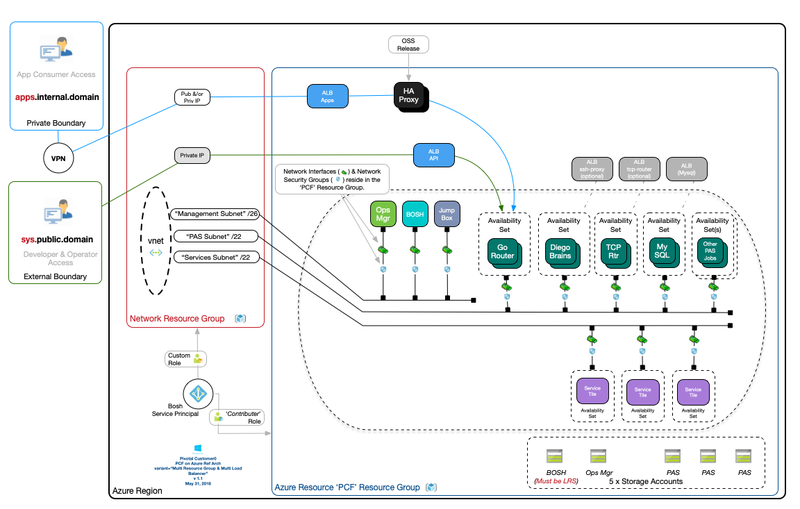 The following diagram provides an overview of a reference architecture deployment of PCF on Azure. The following table lists the components that are part of a base reference architecture deployment on Azure using a single resource group. and a route for TCP routing to apps (optional). Ops Manager Deployed on the management subnet and accessible by FQDN or through an optional jumpbox. BOSH Deployed on the management subnet. Azure Load Balancer - API and Apps Required. Load balancer that handles incoming API and apps requests and forwards them to the Gorouters. Azure Load Balancer - ssh-proxy Optional. Load balancer that provides SSH access to app containers. Azure Load Balancer - tcp-router Optional. Load balancer that handles TCP routing requests for apps. Azure Load Balancer - MySQL Required to provide high availability for MySQL backend to Pivotal Application Service (PAS). Gorouters Accessed through the API and Apps load balancer. Deployed on the PAS subnet, one job per Azure availability set. Diego Brains Required. However, the SSH container access functionality is optional and enabled through the SSH Proxy load balancer. Deployed on the PAS subnet, one job per Azure availability set. TCP Routers Optional feature for TCP routing. Deployed on the PAS subnet, one job per availability zone. MySQL Reference architecture uses internal MySQL provided with PCF. Deployed on the PAS subnet, one job per Azure availability set. PAS Required. Deployed on the PAS subnet, one job per Azure availability set. Storage Accounts PCF on Azure requires 5 standard storage accounts: BOSH, Ops Manager, and three PAS storage accounts. Each account comes with a set amount of disk. Reference architecture recommends using 5 storage accounts because Azure Storage Accounts have an IOPs limit of approximately 20k per account, which generally relates to a BOSH JOB/VM limit of approximately 20 VMs each. Service Tiles Deployed on the Services subnet. Each service tile is deployed to an availability set. 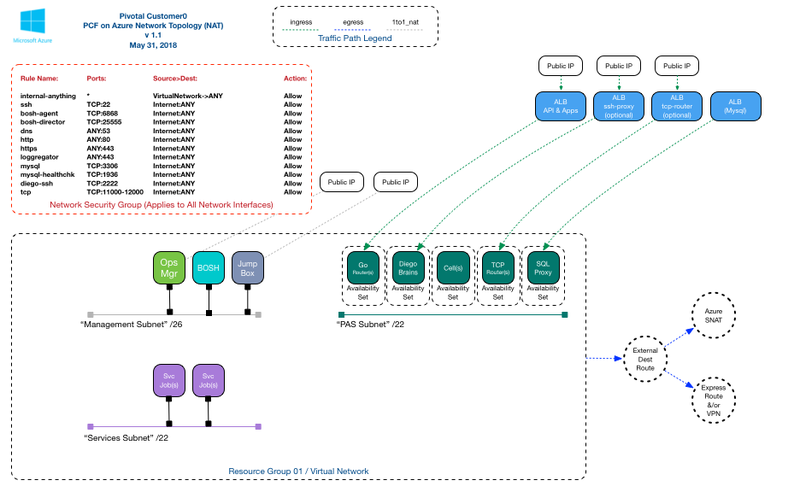 This section describes the possible network layouts for PCF deployments as covered by the reference architecture of PCF on Azure. The first scenario is outlined in Installing PCF on Azure. It models a single PCF deployment in a single Azure Resource Group. If you require multiple resource groups, refer to the Multiple Resource Group deployment section of this topic. This diagram illustrates the network topology of the base reference architecture for PCF on Azure. In this deployment, you expose only a minimal number of public IP addresses and deploy only one resource group. The following table lists the network objects in PCF on Azure reference architecture. Ops Manager or optional jumpbox. 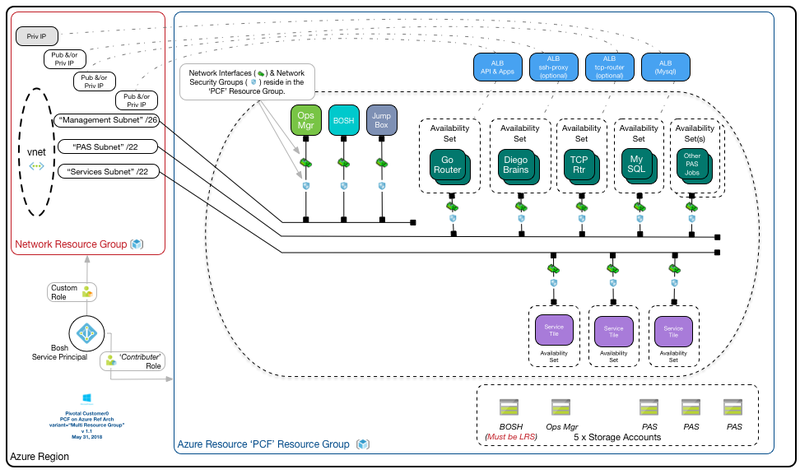 This diagram illustrates the case where you want to use additional resource groups in your PCF deployment on Azure. Shared network resources may already exist in an Azure subscription. In this type of deployment, using multiple resource groups allows you to reuse existing resources instead of provisioning new ones. To use multiple resource groups, you need to provide the BOSH Service Principal with access to the existing network resources. Dedicated Network Resource Group, limits BOSH Service Principal so that it does not have admin access to network objects. Custom Role for BOSH Service Principal, applied to Network Resource Group, limits the BOSH Service Principal to minimum read-only access. The actions prefixed with Microsoft.Network/publicIPAddresses are only required if using IP addresses. Custom roles can be assigned to service principals with az role assignment create --role [ROLE] --assignee [SERVICE_PRINCIPAL_ID]. This diagram illustrates the case where you want to deploy multiple load balancers with your multiple resource group deployment. 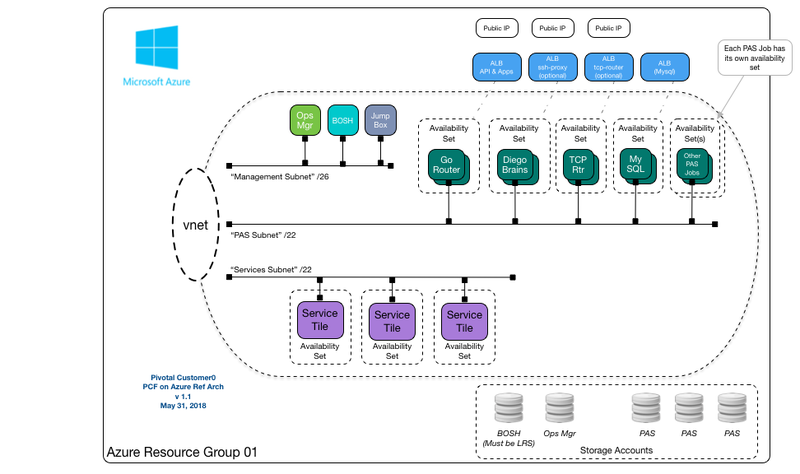 Two Azure load balancer (ALBs) to the Gorouter exist. The first ALB is for API access, which utilizes a private IP address. The system domain should resolve to this ALB. The second ALB is for application access, which can either use a public or private IP address. The apps domain should resolve to this ALB. Azure does not allow the Gorouters to be members of more than one ALB member pool for the same ports, for example 80 and 443. This restriction requires an additional reverse proxy to front the Gorouters to allow hem to expose traffic on these ports for the system domain. Azure Log Analytics is a service that helps you collect and analyze data generated by resources in your cloud and on-premises environments. The Microsoft Azure Log Analytics Nozzle for PCF receives logs and metrics from the Loggregator Firehose, filters and resolves the events, and then sends them to Log Analytics, where they appear on unified dashboards and can be correlated with and alerted on other Azure resources. Azure DNS supports DNS delegation, allowing for sub-level domains to be hosted within Azure. This functionality is fully supported within PCF. Pivotal recommends that use a sub-zone for your PCF deployment. For example, if your company’s domain is example.com, your PCF zone in Azure DNS would be pcf.example.com. As Azure DNS does not support recursion, in order to properly configure Azure DNS, create an NS record with your registrar which points to the four name servers supplied by your Azure DNS Zone configuration. Once your NS records have been created, you can then create the required wildcard A records for the PCF application and system domains, as well as any other records desired for your PCF deployments. You do not need to make any configuration changes in PCF to support Azure DNS. Due to limitations in PCF, it is not possible to support a high-availability deployment of the backing NFS store needed for droplets, buildpacks, and other resources. Azure Blob Storage provides fully-redundant holt, cold, or archival storage in either local, regional, or global offerings. It is recommended to use Azure Blob Storage as the external File Storage to provide unlimited scaling and redundancy for high-availability deployments of PCF. Create a Storage Account with the level of redundancy you require. The storage account does not need to be in the same Gesource Group as PCF. Create Containers for the buildpacks, droplets, packages, and resources required by PCF. Enter the Storage Account details. In the Ops Manager main page, apply the changes when you are ready to reconfigure. Note: There is no direct path to migrate previous objects to Azure Blob Storage. Contact Pivotal Support if you need assistance with this migration. The Azure Load Balancer has two SKUs: Standard and Basic. The Standard SKU Load Balancer is a new load balancer for all TCP and UDP applications with an expanded and more granular feature set over the Basic Load Balancer. Azure’s Standard SKU Load Balancer lets you scale your applications and create high availability in environments ranging from small scale deployments to large and complex multi-zone architectures. While the Basic SKU Load Balancer works within the scope of an availability set, a Standard Load Balancer covers an entire virtual network. Pivotal recommends using the Standard SKU Load Balancer instead of the Basic SKU Load Balancer. If you currently use the Basic SKU Load Balancer and wish to migrate to the the Standard SKU, please see the Migrate Basic SKU Load Balancer to Standard SKU Load Balancer documentation on GitHub.